Summary: This file includes subject correspondence relating to applications of employment with the Highway Department. This file includes applicants with the last name between E and J. 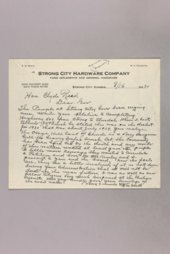 This file is part of a bigger collection of Governor Clyde M. Reed correspondence.